Where: Pyrmont, Bondi, Glebe, Redfern, Balmain, Paddington, Surry Hills, Darlinghurst, Newtown, Campberdown, Ultimo, Chippendale, Barangaroo, Double Bay, Rushcutter's Bay, Cockatoo Island, Palm Beach & Woolloomooloo. Sydney, Australia. Oceania. What: Whale watching, appearing on Australian television (briefly), Luna Park, Opera House and Harbour Bridge, Vivid light festival, ABC HQ, Wild West architecture, Home and Away beach, surfers, Darling Harbour, Australia Day, Chinese New Year, Bondi Beach on Christmas Day, Quirky suburbia. Wildlife spotting: Rainbow Lorikeet, Noisy Minor Bird, Sulphur Crested Cockatoo, Cicada, Huntsman, St Andrew's Cross Spider, crickets, Skink lizards, Cockroaches, White Ibis Bird, Humpback Whales, jellyfish, fruit bats. Mishaps or illnesses: Stepping on cockroaches in the night, coming face to face with a Huntsman walking across the window pane, sheltering from some of Sydney's terrifying storms and working in 40' heat. As a traveller you aren't often afforded the luxury of living somewhere for a sustained period of time; you parachute in, see the basics and, because time is money, parachute out again just as quickly - leaving with only a superficial sense of place and people. This particular Chronicle is, therefore, almost unique on my site; it's the result of living somewhere rather than merely visiting. This means I've had time to go beyond the usual landmarks, get a sense of life here - from the ground up, and attend events and festivals I would otherwise have missed. Good or bad, all things are part of the wider experience of living in a country of which you are not native. Everything is interesting and daily life becomes one long tourist experience. And, of course, this is surely the whole point of emigration in the first place? One year on and I'm still in full tourist mode - my camera is very rarely off for long and my eyes always peeled. Out of all the places we could have lived in this vast continental country we, in a sense, defaulted to Sydney. We didn't really choose Sydney but, I suppose, Sydney chose us and there are worse places to start a new life Down Under. On my first visit to Australia in 2015 I must admit I favoured Melbourne over Sydney feeling that, aside from its giant bridge and iconic opera house, this 'Harbour City' seemed to offer little else. Sydney, like most international cities, can feel cold and corporate; its CBD (city centre) is a largely uninspiring concoction of anonymous financial buildings and retail outlets. Inevitably the tourist dollar skews the city even more towards a soulless candy floss. I came to Australia to be in Australia and enjoy the differences to home but, in places, if the truth be told, Sydney CBD could be absolutely anywhere aside from its smattering of colonial-era buildings which, despite the unsavoury and questionable past they allude to, serve to give the city some depth and sense of history, a history which veers dangerously close to being swallowed up entirely by Sydney's over zealous developers. But that's the CBD. And Sydney is a "city of villages" after all, a title which captures a characteristic of the city oft lost on the majority of visiting tourists: character, colour and the 'aussiest' of life is to be found out in the 'burbs - and you only really discover this when you live here. It's in the suburbs where Sydney's Aussie-ometer is turned up to maximum. Colonial era terraced houses with their distinctive iron lacework railings line the streets, their quirky outdoor mailboxes (a bit of a fascination of mine) as individual as the people living inside the homes themselves. The small front gardens are like shop windows with wacky and alternative displays and with unfamiliar, tropical looking plants. The powerful sun and deep blue skies ensure you see all of this in vivid, natural technicolour. Buildings gracing the corners of streets in particular have a distinct whiff of the Wild West about them and, all the while, power lines disconcertingly zig-zag above your head in a crazed, almost unplanned fashion. Large graffiti murals, artistic and often of high quality, grace the end of terrace walls giving suburbia a hippie, alternative vibe. The city's villages are also sprinkled with some of the most magical, independent coffee shops anywhere - so refreshing, heralding, as I do, from a country where three national chains have all but choked out the independent coffee house. Sydney is also a very green city. Any scrap of land is reserved for nature and is characterised by an abundance of luscious and tropical vegetation, often with a cute little bench or two for you to take a minute out of your day to admire the beauty of it all. What are called 'grass verges' back in the UK are named 'nature strips' here, packed, as they are, with anything from giant banana palms to those plants you'd always thought were 'indoor only' species but positively thrive in the outdoors here. Indeed, wandering around some parts of suburban Sydney morphs into a trip to a botanical garden. Hailing from a country where every bush has been trimmed back to within an inch of its life and every tree cut down in case it falls on someone during a storm triggering litigation, this is all rather inspiring. Undoubtedly all of this lush foliage contributes to the village feel of Sydney. Like a hand, Sydney splays out into the South Pacific Ocean creating scores of coves, hundreds of beaches and countless sightseeing opportunities. Exploring Sydney on the iconic green and yellow ferries feels exciting and adventurous, a permanent holiday sensation which rekindles memories of my time on Venice's vaporettos. It's fun heading out to the unknown; hopping on and off when the mood takes you. 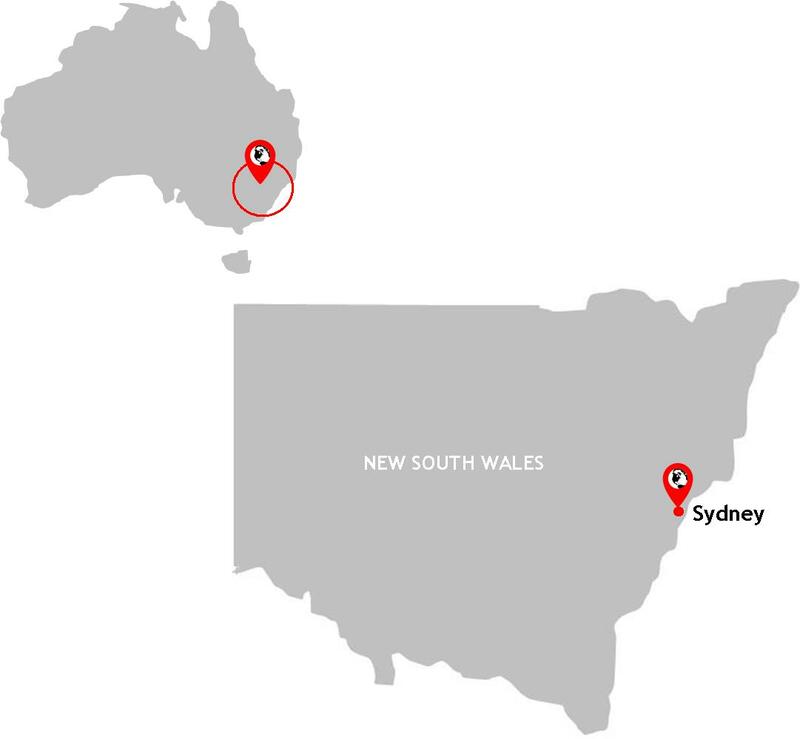 Cockatoo island? Drummoyne? Balmain? Kirribili? Mosman or Parramatta? A bonus afforded to the resident and not the transient tourist is that commuting to and from work on a weekday means that the Opal travel card rewards you with half price travel at the weekend - including the ferry. Beauty, excitement and exploration all at half the cost. 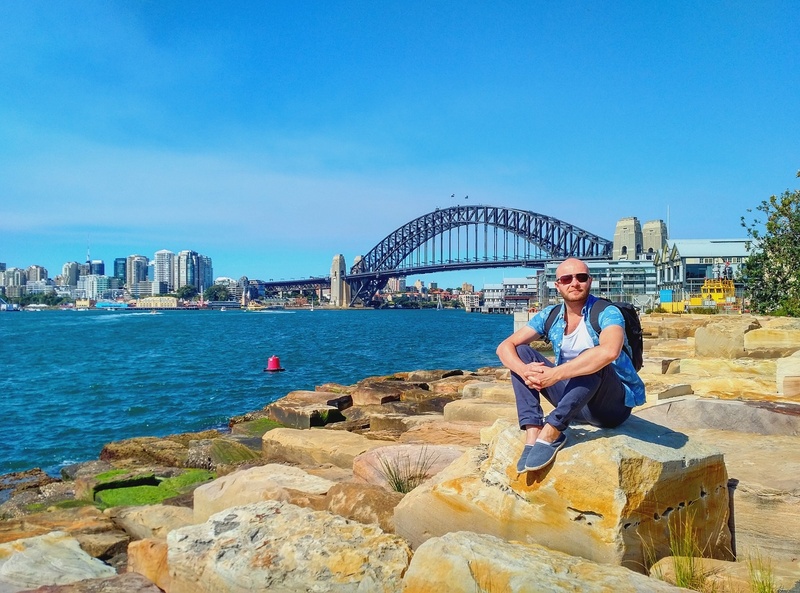 In addition to my long-running Australia Blog, this one year milestone feels like the right time for me to gather my thoughts, package the experience and take stock of my first year as a resident of the New South Wales state capital and Australia's biggest city. From Bondi to Barangaroo, from Woollahra to Woolloomooloo and from Paddington to my home district of Pyrmont, this is Sydney as seen through the eyes of someone who thinks himself mighty lucky to live here: me. At Barangaroo looking across to the Harbour Bridge. Sydney: my city. A world icon on my doorstep: the Sydney Opera House, a blank canvas upon which are projected colourful lights for a whole range of celebrations and commemorations: poppies for Armistice Remembrance Day, red for Chinese New Year and the Vivid Festival. The Sydney skyline as seen from Glebe Foreshore and includes the Barangaroo development, Channel 10 and the Sydney Tower. Bondi Beach sea, sky and fencing. The Sydney Opera House is frustratingly difficult to photograph. The best view can be had from the opposite side of Circular Quay at The Rocks. Failing that, get a Sydney Ferry over to Kirribili. Taking a Sydney Ferry over to Milson's Point will bring you closer to the wonderful Art Deco entrance of Luna Park but will also afford you some excellent views of the Harbour Bridge. Do yourself a favour and buy an Opal Card on arrival in Sydney - and load it up with at least $30. This will ensure hassle-free travel on buses, the Light Rail tram, ferries and trains. You can get these at any newsagent or supermarket. If you love a good coffee shop avoid Australia's only chain 'Gloria Jeans Coffee' but instead head straight for one of the many independent coffee shops the city has to offer. You'll be assured of a friendly welcome and a great tasting shot of caffeine for three Bucks. If your itinerary allows, find time to visit at least one of Sydney's districts. Architecturally, and reasonably central, I can recommend Balmain; it's packed full of colonial-era architecture painted in various shades of pastel. Get your shot of the Opera House and Bridge and then head out. You can get a real handle on Sydney by seeing it from the top of the Sydney Tower's observation deck. Expensive but a great photo opportunity.